Rev. Dr. E. (Ekun Dayo Oní Shangó) (1976-2014) was initiated as an Olorisha to Shangó, in November 2001 in the Bronx, NY. He is the founder of the Santería Church of the Orishas, a dedicated rootworker and conjure doctor, a diloggún diviner and spiritual medium. Rev. Dr. E.'s family has continued his work and maintained his line of products and are also available for readings, rootwork and spiritual consultations through our website at http://www.conjuredoctor.com. 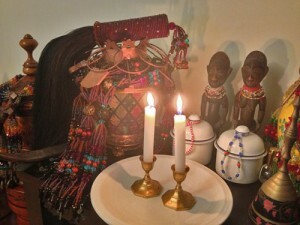 Two candles offered to the Ibeji at the Santeria Church of the Orishas. One of the most common questions I receive through our church’s Facebook page and through our Contact Us page is some variation of “How do I learn Santería?” Indeed it seems to be one of the most challenging questions to get a straight answer on, but I am going to give you the answer I would give a godchild. Hopefully each of you who are interested in learning the religion of Santeria will find your own way to the right person. Before I go into my answer, however, I must preface everything I write here with one bit of information. The Santería Church of the Orishas does NOT give out any referrals to priests outside of our local area (Los Angeles, CA) and we cannot refer you to anyone outside of our lineage. Please do not reply to this article seeking a godparent. That is not the intent of this article. The intent is to educate the public on the right way to learn; it is then up to you to find the right godparent. In order to understand the way you learn Santeria, you must understand the history of our faith and our culture – for the two are largely indivisible. Santería Lukumí came together on the island of Cuba as the aggregate worship of the various Yoruba-speaking people from different tribes, along with elements of Arará worship, Catholicism and Spiritism. For many generations it was protected and kept secret – as something solely for African people. But over time, African people and European people began to have children of mixed ancestries and as such, the doors to Lucumí slowly (and reluctantly for many people) opened to non-African participants. But even then, the practice of Lucumí was something you did because your family did it. It was tribal – and in many families it continues to be tribal. At its core, Santería Lucumí is NOT an individual practice, is not a personal path, and is something you inherit and pass on to others as elements of a culture that survived the tragedy of slavery in Cuba. You learned Santería because it was what your people did. You practice Santería with others in the community, because it serves the greater whole. 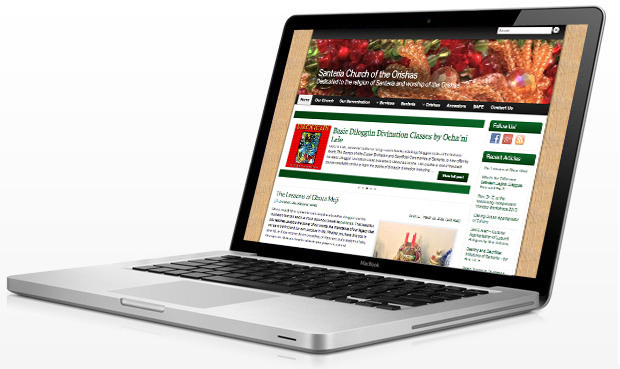 Even our church’s website isn’t a replacement for training in-person with your godparent. With the advent of the internet and mass social media, communication has become easier than ever. More and more people have discovered Santería Lucumí and are attracted to the orishas. But sadly, many people bring with them an American, fast-paced culture of instant results and quick fixes. This clashes with the traditional Lucumí way of learning. This has resulted in many people gobbling up information on websites and through books that are poorly-informed at best, or damagingly misleading at worst. Some have taken to “worshipping” in their own invented manner, often grafting the Orishas onto neo-pagan traditions like Wicca, or utilizing the orishas like a table of correspondences when performing candle spells or folk magic spells. Still others approach the religion thinking “I WANT TO BE INITIATED!” Not realizing that initiation into Santeria is something that is marked through divination because you need it, not because you want it. 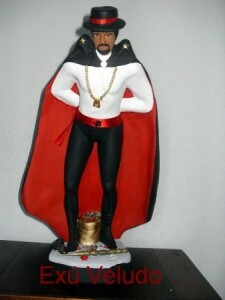 There are many scoundrels and charlatans who have taken advantage of this generation of American-cultured people by offering sham initiations through the internet, or mail-order orishas, or a multitude of culturally appropriated products that steal the imagery, symbolism and religious elements of Santeria Lucumí outside of a cultural or traditional religious context. That is why our church founded SAFE – Santeros Against Fraud and Exploitation – in order to educated the public about what is traditional, legitimate practice and what isn’t. To be forewarned is to be forearmed. In spite of the wave of cyber-fraud and poorly educated priests touting themselves as experts behind an internet-devised persona, there are still many lineages and houses that practice the proper way, training people in true apprenticeship, with the utmost of ethical integrity. So How Do You Learn Santería Lucumí? The first thing you must do to learn Santería Lucumí is that you must find a godparent. This can be a man or woman who is initiated as an Olorisha in the religion. A Babalawo may be able to help you with life problems, but he will not be able to give you the required elements to proceed in the religion beyond the limited few that a Babalawo can give (Hand of Orunla, Idé of Orunla and Ifá warriors – he cannot crown you with an orisha like Chango, Eleggua, etc. He can only initiate others to Ifá as babalawos.). I highly recommend that you take your time before you dedicate yourself to one priest or priestess as your godparent. Take a few months and get to know that person – the longer the better – before you jump into receiving any initiations from him or her. I also recommend you work with ONE PERSON AT A TIME. Do not “shop” several olorishas at a time. That is highly disrespectful and insulting. Our religion is a practice of discipline and respect, not one where you select a godparent based on the lowest bidder. Learn from one olorisha, and if you find they are not a good match, formally end the relationship with them before going to find another one. You can’t have your feet in two different camps at the same time. Divination with diloggún is one of the best ways to learn where you are on your path to destiny. One of the first things you should do is to get a diloggún reading (or an Ifá reading if you are part of an Ifá house) from your godparent, or a diviner that they trust. The reason I recommend a diloggún reading is that you will be communicating with the orishas themselves – not with spirits of the dead or someone’s intuition. A spiritist mass (misa espiritual) is not a suitable alternative to a diloggún reading! The orisha Elegguá will tell you what your destiny is and where your path in the religion lies. The religion – as much as you may love it – might not be the right place for you, and a diloggún reading will tell you as much. It will also tell you if you need to be initiated or not (for those folks who come wanting to know if they can be initiated). Not everyone has a destiny that includes initiation! But the reading will give you a clear understanding of our working relationship with the orishas in our faith, and also expose you to our divination systems, and the technology of ebó. Additionally, I’ve found that watching an olorisha’s divining style says a lot about how they function as a godparent. Are they taking time to give you guidance on how to make the most of the sign that comes out in the reading? Are they giving you positive and negative elements to the sign or are they simply giving a “doom and gloom reading?” Are they trying to find simple ebós to do to remedy your situation or are they immediately jumping to sacrificing the entire barnyard of animals? Are they pushing you into doing an initiation you don’t want to do, or are they simply prescribing the initiation and telling you that it would be in your best interest – then letting you decide in good time? These are all things to watch out for in a divination. Do you have a question about something you don’t understand in our religion? Ask your godparent! As tempting as it might be, don’t go looking for answers on internet discussion boards and websites (yes I see the irony of that statement). We have a saying for those places: “In the town of the blind, the one-eyed man is king!” Most people on internet discussion boards are half-educated or think they know a lot because they have 5 years of initiation. There are masters in our religion with over 40 years of initiation and actual experience in an igbodú (sacred ocha room) that you could be asking who will have your answer and the history behind it! But you have to ask them in-person. 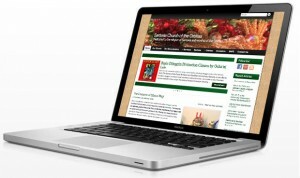 A website is no replacement for in-person learning. Always ask the person to whom you have entrusted your training – your godparent! Always verify things you read online by confirming them through your godparent, as there are variations from lineage to lineage within our religion. Save up a list of questions and their answers in a notebook. I used to do that, and while it did drive my godparent crazy, in the end I was glad for it. Those answers proved to be precious jewels of information that so few others actually had access to. Ask your godparent’s elders (if they are around) to see if they can elaborate on the situation – just ask your godparent first so you don’t seem to be jumping over his/her head. Remember the most important question of all: “Why do we do that?” All too often priests and priestesses in our religion learn by copying what others do, and never learn why we perform ritual actions in a certain manner. All of our ceremonies, our songs, our rituals, our offerings, our prayers and our traditions are encapsulated in odu (the signs of the diloggún divination system). There is a reason for why we do things, and often times, once you understand the reasons for our actions, the ritual actions are even easier to remember. You can also weed out an Olorisha’s personal superstitions and style from the actual practice of Santería by doing this. Also remember there is a time and place for everything. Stopping your godparent in the middle of a ceremony to ask why they are doing something is not usually a good idea. It is best to wait until there is a break in the ceremony or until the ceremony is done and quietly pull your godparent aside and ask them why ritual actions were done. That way your godparent can focus on completing the ebó or ritual and not get sidetracked with questions. Also, some godparents do not like to be questioned in front of their peers, and this method preserves the respect between godchild and godparent. Questions are best asked in private to avoid problems. Santería Lucumí is traditionally learned through true apprenticeship, not in sit-down classes. This means that as a newcomer to the religion, you learn the most menial of tasks first: taking out the trash, plucking chickens, sweeping, washing dishes, mopping the floor, etc. What you should be focusing on is the sanctity found in service toward others. If no one takes out the trash the ritual won’t be able to proceed. Your role as the trash guy is just as critical as the Oriaté’s role in singing the songs of the ritual. Take pride in a job well done even if you’re just plucking chickens, for it is in humbling ourselves to serve that we learn what communal religion really is about. It’s not about titles and ego, it’s about love, community and service. While you are performing chores, listen attentively to the conversations taking place around you. You will absorb information about past rituals, information about odu, historical accounts of old Santeros and Santeras and how they used to do things, and THAT is how you start to learn in the religion. Gossip less, and learn more by listening while doing chores! Offer to do the things no one likes to do, or by watching. Stand next to the butcher and watch how he or she opens the animals so that you can learn how to do it. Offer to crack open coconuts and remove the meat from them, and you’ll learn a few tricks from older olorishas. Offer to clean up the area outside dedicated to feeding the dead, and set it up with its offerings of drinks and food. You’ll learn a lot about how to propitiate the ancestors in the process. Sit side-by-side in readings (if your godparent permits it) so that you can begin to understand the mechanics of a diloggún reading, and if you have questions ask your godparent after the reading is done to better understand how it works. This is the meaning of true apprenticeship and it is how we learn to practice Santería Lucumí. One of the common mistakes of newcomers to the religion is that they want to create a personal and friendly relationship with their godparent. I do not recommend this. I find that this crosses certain lines and can actually cause friction between godchild and godparent. I’ve found in my own life as a godchild and as a godparent that the best way to keep the relationship between godparent and godchild healthy is to keep a healthy professional distance between the two of you. Offer to help your godparent, reach out to them regularly so that you can know when events are taking place and see if you can attend them, but do not spend personal and casual time together like buddies. This can actually cause there to be resentment, spreading of gossip and misunderstandings about expectations. This also helps prevent unethical behavior from happening on either side of the fence. Santería Lucumí is an initiatory religion and many of its aspects are secret. The contents of our ceremonies and some of the deeper rituals we perform are secrets that are not given to those who are uninitiated. It is normal to be told by your godparent that they cannot answer your question until you’ve been initiated as an Olorisha and been presented to the Igbodú (sacred room). Do not despair, there are still plenty of things you can learn before initiation. If you have not yet received any initiations, it is best to focus your learning on understanding the structure of the godfamily, getting to know people in your godfamily and learning general information about the religion. Learn the best ways to do all of the chores in the religion: trash, washing dishes, opening coconuts, plucking chickens, etc. Also learn about the orishas: their likes and dislikes, what forces of nature they have dominion over, their colors, numbers, patakís (legends), etc. Start to build relationships with the orishas through offerings of addimús, fulfilling ebós with your godparent’s guidance, and learning their songs and dances. Going to drum ceremonies are a good way to learn the songs and dances too. 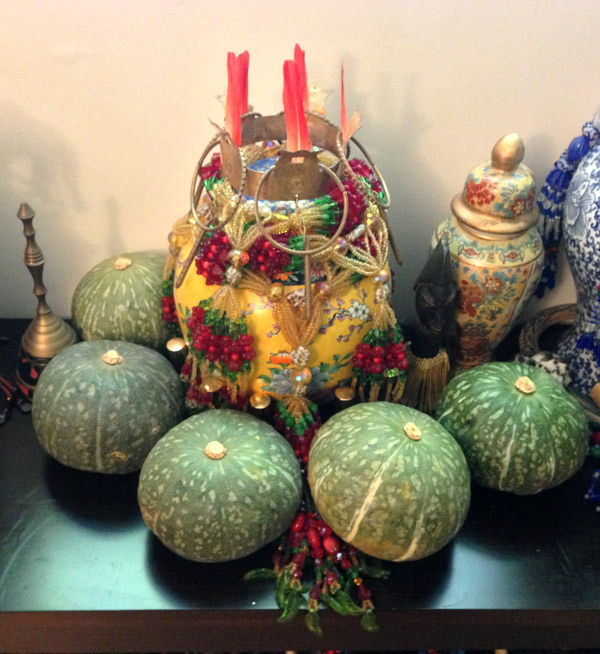 A traditional Lucumi Egun shrine with offerings to the ancestors. The first place most newcomers to Santería begin their devotions is with their personal ancestors. Everyone has access to their ancestors, whether it is through the traditional Lucumí shrine that is placed on the ground, or through Espiritismo and the bóveda. The best thing a new aleyo can do is to start by developing a relationship with their ancestors, guides and spirits as well as learning how to listen to their guidance. This is where having a godparent is important, as they can guide you and show you how to communicate with the ancestors and how to make proper offerings to them. Most newcomers will participate in spiritist masses (misas espirituales) as a way to develop their mediumship skills and build relationships with their guides, under the tutelage of their godparent as well. As you learn and grow in Santeria you’ll run across other adherents of the faith and invariably you’re going to learn about varying practices and seeming contradictions in the way people follow our faith. It’s important to keep an open mind and not judge others in the process of learning. It’s easy to paint things in black and white but until you’ve been fully initiated in the religion and know the inner workings of our ceremonies, it’s going to be hard to discern what is legitimate variances in practices versus what is misinformation or fraudulent practices. One of the best things you can do is take any information you gather back to your godparent for verification and explanation. Then stick to the way things are done in your god-family. You’ll grow in your community, learn and form respectful bonds with your god-family. As you make your way in Santeria you’ll see just how best to function as a tribe, how to honor the ancestors, the orishas and your family through your actions and in how you conduct yourself in life. Pumpkins are a very important ebó when someone receives the odu Obara Meji. They are a gift for Oshún and Changó to bring prosperity. Obara meji (6-6) is a powerful and complex odu within diloggún and Ifá divination that can teach us much about our power as olorishas. This beautiful odu teaches us about the power of our words, the importance of our legacy that we leave behind and our own purpose in life. Whether you have this odu in your itá, or if you receive this in a reading, or if you are just a student of odu, this sign can show you how to cultivate your power as a priest. In the odu Obara Meji we say “The King Does Not Lie”. This is an odu of royalty, and this sign indicates that the person being read with the shells is of a regal nature. But being a king does not mean you get to boss everyone around – as tempting as that may be. Royalty is not just about ancestry, it is about cultivating the proper manner of conduct and recognizing what it takes to lead people. A simple trek through any history book teaches us about good monarchs and corrupt ones. Kings, being given a divine right to rule, are often unchecked, untrained leaders who run amok. If they are a malevolent, ill-tempered and volatile king who lashes out at anyone who challenges his rule, they are hated by their people and become the focus of bloody revolutions. However, if they are benevolent, even tempered, receptive and responsive to the needs of their people, they will stay firmly seated on their throne of power for their entire lives (as will their descendants). This sign teaches us that to be a good leader, one must be honest, forthright and have integrity. To live up to the royal inheritance this sign promises we must learn that honesty is the cornerstone of power; and the more one lives an honest life the more power one’s words have in the ears of those around them. But just as power can cut both ways, so too can honesty be a knife that cuts the wielder and the victim. Honesty must be delivered with tact. Tact is the sheath that keeps honesty from hurting everyone around you. Delivering truth in gentle and non-offensive ways is the mark of a good leader. Hiding truth behind lies or a resentful holding of the truth to avoid confrontation, however, is the mark of weakness. The king does not lie, and so we must learn to deliver the truth as a loving parent would to his children, without anger and without vengeful bitterness. 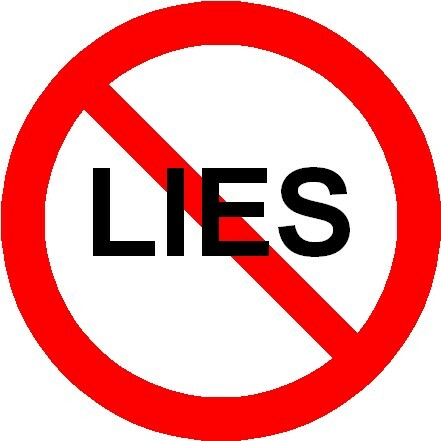 Lying is forbidden in the odu Obara Meji. It kills the power of a person’s word and those very lies can manifest into reality. This famous saying is well-known by olorishas, aborishas and aleyos in Santeria. Many times it is said as an adage to remind us all that knowledge is power and to be forewarned is to be forearmed. Obara Meji teaches us that in order to survive we must know the ways of the world, the nature of our true self, and the path to destiny. Divination gives us a glimpse of our path toward destiny. It is Eleggua orienting us and letting us know where we are in our path, what lies immediately ahead, and how to prevent any calamities through ebó. In ebó there is a solution to bring us back into the graces of iré, but most people forget that ebó had two parts to it: sacrifice and behavior modification. While sacrifice does give us a spiritual technology to dramatically alter the flow of ashé in our lives and give us the lift we need to overcome obstacles and osogbo, it is behavioral modification that prevents us from falling back into the patterns that caused that osogbo in the first place. 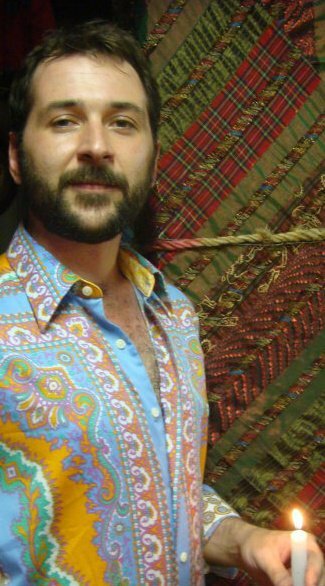 As a diviner, I’ve found that clients are too focused on things they have to do, versus on the kind of a person they need to be. There is more power and positivity to be found in following the behavioral restrictions, the taboos and the advise that odu gives us than just in the act of offering fruit to the orishas or taking a ritual bath. Yes, the offerings and rituals are important too, but they are in vain if you are unwilling to make the change within yourself after your consultation with diloggún. He who knows doesn’t die, like he who doesn’t know. Obara Meji teaches us that knowledge is the key to our survival. Not only does divination forewarn us against our pitfalls that lead to osogbo, but so too does knowledge of self. In this sign, understanding one’s own weaknesses and strengths is critical. Weaknesses should be something we actively work on overcoming, healing and cultivating into strengths. Yet it is often our strengths, perverted by neurotic behavior that manifest as our weaknesses. For example, if you are incredibly well spoken (and Obara Meji does signal someone with a fast tongue) that may be a strength, until those fast-flung insults and quips start flying in a moment of anger. Now your strength of being a good speaker has become a weakness of being a rude and insulting jerk. Understanding the nature of your weaknesses is half the battle, and Obara Meji teaches us that it can save our very lives. In Obara Meji we say that the client’s tongue (or speech) has lots of power. We say that the tongue can save or destroy a village, and we would be well served to remember this when we are under this odu’s influence. We often forget the power and influence that our words have over others. An innocent, but poorly-timed quip can utterly destroy a person’s self-esteem or ruin an event. Similarly, a well-timed and crafted word of encouragement can lift up a person’s spirit or even save a village. This is the power of Obara Meji. We are well served to remember the power of the tongue when we are under the influence of Obara Meji. We can utilize this power to our advantage if we are crafty, intelligent and strategic. Our powers will manifest into reality, and as such anything we speak WILL BE! We can speak affirmations and positive goals when under the influence of Obara Meji knowing that this odu’s power will manifest them. We should avoid speaking negative comments, insults, curses and lies because our tongue’s ashé under this sign will make them be so. Remember that controlling the tongue is the key to succeeding under this sign. Use the tongue’s power for constructive ends and you will ride Obara Meji’s power to the benefit of all. This is just a cursory exploration of Obara Meji but it is something every priest needs to keep in mind. Our ashé is seated on our heads, but manifests through our words and actions. Remember it is our actions that become the legacy we leave behind. We should all work to leave behind a legacy of constructive deeds, good character and positive memories that our descendants would recall us with fond memories and praise our names for generations. 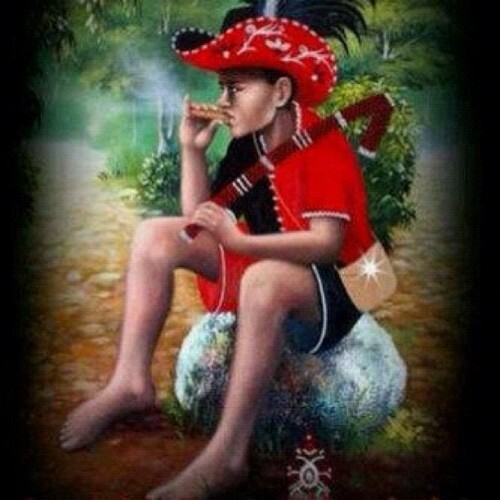 An artist’s depiction of Eleggua as a young child. There seems to be a big misconception in online communities about who Eleggua is, how he’s related to Papa Legba, or Eshu, or even Exu. All too often, our western minds see similarities and draw equivalences between these entities but doing so is a big mistake. After a friend asked me what the difference was between these spirits, I decided to contact my friends in two other African Diasporic religions: Hougan Matt (Bozanfe Bon Ougan) a Hougan Asogwe of Haitian Vodou and ConjureMan Ali (Tata Alufa Mavambo Ngobodi Nzila) a Tata of Brazilian Quimbanda, and asked them to share their scholarly expertise to the following questions. Answers are listed side by side and color coded with Houngan Matt’s answers in blue, ConjureMan Ali’s answers in red and Rev. Dr. E.’s answers in green. Just to clarify, Legba is from Haitian Vodou, Eleggua/Eshu is from Santería Lucumi (and consequently Yoruba religion) and Exu is from Brazilian Quimbanda (and Umbanda). These are three different classes of spirits and he offer this information here for you to understand the difference between them. Who are you and in which tradition do you participate? Rev. Dr. E.: I am Rev. Dr. E. or known by my initiatory name of Ekun Dayo. I am an olorisha (priest) crowned with Changó in the Afro-Cuban religion of Santería (La Regla Lukumí). I am founder of the Santeria Church of the Orishas and a full time conjure doctor. Who is Legba, Eleggua, Eshu, Exu? Houngan Matt: (Regarding Legba) The Legba spirits, in Vodou, are a family of lwa who each are responsible for “opening the door” or initiating access to each section, or ritual division, of spirits that are served in our rites. Each nancion, or nation (a term used to distinguish groupings of lwa by their home culture or the people whose spirits they were before those people were brought to Haiti as slaves) has its own door-opening spirit referred to as a Legba. There are many such corresponding divisions of lwa, and each has their own Legba tasked with opening the door and allowing those spirits to pass. The Legbas are spirits of communication and contact, removers of barriers and openers of doors, who speak all languages and know all forms of communication. In a fete, one of the Legba spirits is always among the first spirits sung for and invited to come to the party with us… but there’s a good deal of misconception out there about what this means. Contrary to internet-misinformation, when the priye ginen (our litany of prayer and song that blesses and begins all services) is complete, the first spirit we sing to is Hountor, the lwa of the drums, who translates our modern speech and song into the tonal language of the drums, the ancient spirit-speak us Creoles no longer shape with our mouths. Then, we sing into being Grand Chemin, the Great Road that bridges our place of ceremony and the land where the spirits reside… a great and golden road the lwa proceed down to come to our temple (and, often, also the poto mitan, the central axis of the temple which our spirits can ride). Legba nan Rada, or Legba in the Rada Rite, is the first of the Legba spirits we serve, and his task is to open the gate on the Great Road, the doorway that allows the other spirits to come to our celebrations and rites. Without him, there wouldnt be a gap or a coming-together-place where our world and the world of the spirits could touch. In Vodou’s language of visual symbols that convey meaning, the imagery used to represent the various Legba spirits always features the symbol of the Poto Mitan in some way or form as it is the doorway on the Great Road that Legba controls. 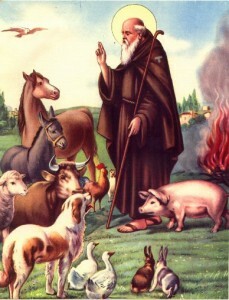 For my lineage, the Rada Legba wears a saint known as Saint Anthony the Abbot (a jovial and well-fed man in brown robes, holding a staff, the poto mitan, and standing at a cave door, surrounded by animals such as pigs and chickens). Legba nan Petro, the Legba who opens to doorway for the hotter and rougher spirits of the Petro rite, wears the image of Saint Lazarus (typically an emaciated and sometimes bruised man walking by means of crutches, another symbolic stand-in for the Poto Mitan). The Ghede family, the spirits that are called at the end of every Vodou celebration, also have their own door keepers/Legbas of their group… and are also known for carrying a Baton Ghede, a walking stick that can alternately be a gentlemen’s cane or be placed between the spirit’s legs as the source of many embarrassing jokes… but which is also, in its way, the Poto Mitan and the road by which the spirits in the Ghede’s purview travel. In Haitian Vodou, the Legbas are not Crossroads spirits; the way our rites work, the road by which the fiery Petro spirits are brought into the rites is conceptualized as being at a 90 degree angle to the cooler road by which the Rada lwa enter. When the Petro rites have begun, songs are sung for Dan (or Don) Petro (mythologized as the creater of the Petro system, but basically the Grand Chemin figure of the new cosmological angle of approach), then comes the Petro Legba, and after a few more spirits the rite reaches Kalfou, the lwa who is the crossroads made manifest (Kalfou is a creolization of the French Carrefour, literally crossroads). To us, the Legba figures are the keepers of gates and doors, languages and communication… not the crossroads, which we have as a different being entirely. ConjureMan Ali: (Regarding Exu) Exu, pronounced “Eshoo” in Quimbanda is not a singular entity, but a class of spirits that are connected to the Congo and Angolan cults of sorcery and necromancy that took root in Brazil after slaves were brought over by the Portuguese. It would be more accurate to view Exu as a title referring to a class of fiery spirits called upon in the Afro-Brazilian cults for matters of guidance and to work magic. Each Exu is unique and the personalities can vary drastically from one Exu to another. Regardless of the differences what is common is that Exu is a highly dangerous, fiery, and tricky spirit to work with. Exu is not an Orisha, or Lwa, but are earthly guardians of the liminal who are both a force of nature as well as spirits of the dead. Rev. Dr. E.: (Regarding Eleggua/Eshu) First we must distinguish between Eshu and Eleggua. Eshu (spelled Esu in traditional Yoruba with a little dot under the “s”) are a family of orishas more like natural forces. Eshus are found everywhere in the wild and each is different from the others. Eshus are wild and uncontrollable by nature. Messing with one without the proper respect will get you in big trouble quickly as it is the nature of Eshu to cause problems, test humanity and upset the balance of things. Babalawos are experts at working with an controlling Eshu for the betterment of humanity. They have the spiritual technology to tame Eshu. Eleggua (or Elegba) – to contrast – is an orisha that can be considered to be the king of the Eshus. He is refined; civilized if you will. Eleggua is an orisha that has many roads each of which is called “Eshu” (to further confuse the issue). There is an Eleggua that wanders in the wilderness. There is an Eleggua that lives in the river. There is an Eleggua that lives on the road. There is an Eleggua that lives in the house. There are over a hundred different roads of Eleggua and each is different from the others, with different temperaments and different likes. There is one thing in common with all Elegguas – they are always honored first amongst the orishas whenever we have a ceremony. Eleggua knows everything, witnesses everything and has the key to changing our destinies as humans: ebó (sacrifice). He is the one that can speak for all of the other orishas because he knows everything that’s going on. Eleggua is considered one of the warriors in our religion along with Ogun, Ochosi and Osun (as well as Erinle and Abata). He opens the road to all things and makes the spiritual connection of ache happen between humans, Olodumare, the orishas and the ancestors. Without Eleggua nothing would get where it is intended to go. Because of this we say you must always be in his graces or he’ll shut you down in no time. Where does the worship of Legba/Eleggua/Exu originate? 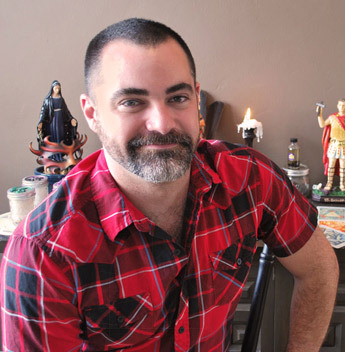 Hougan Matt: (Regarding Legba) The Legba spirits are an intrinsic piece of the religion of the Fon people of Dahomey (and modern day Benin) whose cosmology forms the majority of Vodou’s metaphysical foundation. (Even the word Vodou comes from the Fon word meaning “spirit”; Lwa in turn is the Fon/Gbwe word for “lord”) Their religion continues in its homeland, now usually known as Beninois Vodou. MANY pieces of the Dahomean Legba (the Root legba, if you will) changed with the combination of many different Kingdoms’ religions that happened in Haiti, on its plantations and as a result of the Revolution that made a single united Nation out of the many slaves who rebelled and forced their French overlords off the island in bloody revolt. Knowing there was no way “home” to their ancestral Africa, the new Haitians blended their religions together to keep them from being lost, and the many different manifestations/individual traditions of Haitian Vodou were born… but, in the process, many spirits took new aspects to their personalities and many new needs were filled by spirits who emerged. New Legba figures emerged to open the doors to spirits of new and different populations that took their place among the other spirits of the newly emergent and uniquely Haitian Vodou. ConjureMan Ali: (Regarding Exu) Exu’s roots are found in the Angolan and Congo cults of Kalunga, Kadiempembe, and Pambujila. He emerges from a fusion of death, fire, and the crossroads. The descendent of these forces is then Exu who finds his home in the Afro-Brazilian religion of Quimbanda. It is important to note, that Exu exists only in South America, starting in Brazil and slowly expanding to neighboring countries, he is not found in any of the North American African Traditional Religions and has nothing to do with Lukumi, Vodou, Palo etc. Rev. Dr. E.: (Regarding Eleggua/Eshu) Eleggua and Eshu’s roots are in the west african Yoruba people who lived in the area currently associated with southwestern Nigeria and Benin. They were universally revered throughout all of the tribes that spoke the Yoruban language. The slaves that were taken from the Yoruba lands and brought to Cuba brought the veneration of Eleggua/Eshu with them. The understanding of Eleggua as separate from Eshu evolved in Cuba within the Santeria religion. Eleggua and Eshu are seen as pretty much one and the same back in Africa and this may be due to the prominence of the Ifá sect of Babalawos in the motherland versus their late arrival in large numbers in Cuba. To be very clear, Eleggua is not found in Vodou (although the Lwa from the Nago Lwa are technically the same as the orishas, he isn’t worshipped in the same manner as we do), he is not found in New Orleans Voodoo although some modern-day practitioners are attempting to culturally appropriate him for their benefits, and he is not part of Palo Mayombe. He is an orisha, not a lwa, not a mpungo, and not a spirit of the dead. Is there any ritual or initiatory requirement to work with Legba/Eleggua/Exu? Houngan Matt: (Regarding Legba) Nope. 🙂 Well, almost. In terms of initiatory requirement, no… as the Legba spirits govern communication with the rest of the spirits, ALL people are seen as inherently having a connection with these Lwa (unlike the others, which may or may not be “with” a person and whose presence “with” a person must be determined by divination). As all of us are born with an ability to serve those spirits we inherit or who seek to build relationships with us (those that pop up in that aforementioned divination) ALL of us have access to the Legba spirits, either for opening those doors and forging roads of communication and respect, or for working with the way we would any spirit we serve. In terms of ritual requirements, yes… to work within Haitian Vodou requires keeping to Haitian Vodou’s ceremonial protocols, rules, and heirarchies. We are not a freeform religion, but one that has a very solid cosmological core and an associated body of traditional rites, songs, and methods of ritual. Not everyone needs to become an initiate to work with their spirits in our religion, but our religion is guided by its priests to maintain its lore and the integrity of its tradition and systems; in a similar vein, not all Catholics need to be priests, and certainly one does not need to be a priest to say the Rosary in home prayer… but for transmission of the faith, the services of the priesthood, and the offering of Mass, the clergy is required. Vodou is much the same in how it works and functions, and the faithful, while they are capable of small acts of service to their spirits at home, also understand that the faith is a community religion that requires the community of priests and laypeople alike in community celebrations to function at anything beyond its most basic level. 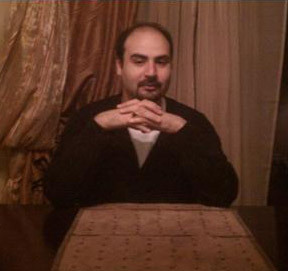 ConjureMan Ali is a Tata of Brazilian Quimbanda and founder of the House of Quimbanda church. ConjureMan Ali: (Regarding Exu) Yes! Exu has a strong sense of respect and honor. In order to call upon Exu, there are set ways that they demand you approach them. It is also the safest way to work with them, for without the context of protection provided by following these well-worn roads, you risk burning yourself. It is like playing with fire. In Quimbanda, there are levels of involvement that one can participate it. Initiation is for those who are called to be priests and priestesses. Not everyone is called to that path. One can also be a licensed medium through a baptism ceremony, or licensa. In this case you can then safely work with your personal Exu and Pomba Gira. Finally, anyone can benefit from finding out which Exu or Pomba Gira form the spiritual court of your life through divination. This latter is only to find out about them and does not require any obligation nor do you need to get involved further. It is basically taking a look behind the curtain. For further involvement, you will need to look at licensa or initiation. With licensa you take your personal Exu and Pomba Gira as your patron and work with them in a spiritualist or devotional context. You work with those spirits that walk with you and develop a relationship with them which has many benefits. Initiation however is a more intense path with much obligation and so is not meant for everyone. The initiated Tata or Yaya is granted the Keys to the Kingdom of Quimbanda and while the core of their spiritual court is their personal Exu and Pomba Gira, they will become a priest to the entire Kingdom with many spirits working with them. It is also the initiated Tata and Yaya who work as the sorcerers and sorceresses of the cult. Without either licensa or initiation, calling upon Exu can be quite dangerous. 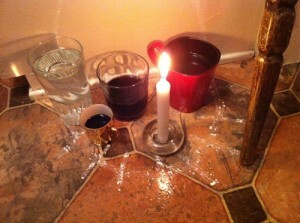 There is a unique format to their rituals that is only taught through the guidance of a House or terreiro of Quimbanda. Without this format you aren’t calling Exu, you are simply opening yourself up to any spirit walking by to come into your life. Rev. Dr. E. (Ekun Dayo Oní Changó) is an Olorisha in Santería (La Regla Lukumí) and founder of the Santería Church of the Orishas. Rev. Dr. E.: (Regarding Eleggua and Eshu) Yes and no. 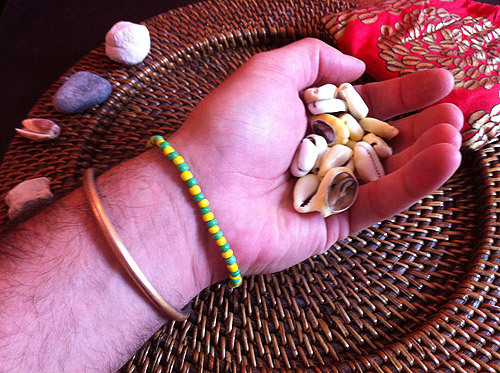 Anyone can give offerings of the heart or veneration to the orishas in nature. For Eleggua or Eshu this would be the places where he can be found: the side of the road, the wilderness, the cemetery, the edge of the river, the ocean, the crossroad, almost anywhere – but keep in mind that different Eshus and Elegguas are found in different places. But this is a personal offering made for yourself and you must act carefully as to not offer Eleggua or Eshu something that they wouldn’t like. Guidance of a godparent is probably the best idea in this situation. It is highly improper and offensive to the orishas to act in the office of a priest or priestess doing work for others without being an Olorisha or a Babalawo. You don’t have the lineage to call upon if you aren’t initiated and as such do not have the support of the ancestors and even they come before Eleggua! You need to be an Olorisha or a Babalawo to have received the ritual items and shrines of Eleggua or Eshu. This is a highly involved ritual and requires divination before going through it. It’s not something you receive because you want it. It’s something you do because divination says it’s part of your destiny and you need it. Once you have been ordained as an Olorisha or a Babalawo you can then divine with Eleggua’s shells, make ebó (sacrifice and rituals) to Eleggua and act as an intermediary between the general public and Eleggua or Eshu. How can a person revere Legba/Eleggua/Exu and pay homage to him? Houngan Matt: (Regarding Legba) Easily! If a person is interested in establishing working relationships with their spirits through Vodou’s traditions and paradigm, the Legba spirits are going to be some of the lwa they’ll be speaking to most! I recommend seeking out the image I spoke of before, of Saint Anthony the Abbot (this is not Saint Anthony of Padua, who holds the infant Jesus. Instead this is the staff holding monk standing before a cave, surrounded by happy animals, and the image can be found through a google image search and printed out) and possibly creating a small working altar (in a clean place outside one’s bedroom, or able to be screened from view if the bedroom is the only possibility) decorated in cloths of white, red, and brown (white for all Rada spirits, and Red and Brown are the colors of the Rada Legba in my lineage). The altar should also have a glass of cool, clean water, white candles, a crucifix (a strand of rosary beads works in a pinch) and a space for simple offerings such as flowers, fruits, florida water, or specific foods. Favoured offerings of the Rada Legba are red and white flowers, roasted root vegetables such as potato, yam, and sweet potato, cassava bread, and a mixture of pan toasted (but not popped) corn kernels and peanuts. The Rada Legba in my lineage takes poured offerings of white rum as his favoured beverage, and also likes material gifts of straw hats, pipes, and plain pipe tobacco. Clergy guidance is strongly encouraged. ConjureMan Ali: (Regarding Exu) We honor Exu, but we do not worship Exu. This is a very important distinction to make as God, or Nzambi, is the only figure that worship is given to. In Quimbanda, one does not give homage to Exu randomly, but has to find out which Exu specifically walks with you. Because there are countless Exu, you cannot simply decide to light a candle to one, or pray to him. This invites a great deal of trouble as it opens the door to all sorts of trickster and parasitic spirits. It is essential to first find out which Exu walks with you through the divination provided by an initiated medium or priest who can then instruct on how a proper relationship can be formed. Rev. Dr. E.: (Regarding Eleggua and Eshu) No matter what you do it is important to understand that we do not worship Eleggua, we pay homage to him and work with him. We only worship God – Olodumare/Olorun/Olofi. One of the most effective ways to honor Eleggua in your day is to always ask for his blessing when passing his location in nature that you associate with him. So if you work with the Eleggua or Eshu that’s by the side of the river then make sure to say “Agbe mi Eleggua!” or “Bendición Elegguá!” when you pass the river’s edge. That way you show him continual gratitude and make sure he keeps your road open for you. Before you go making fruit offerings or such to Eleggua or Eshu it is imperative that you work with a godparent so that you can be sure you’re offering him the right things in the right ways and in the right places. 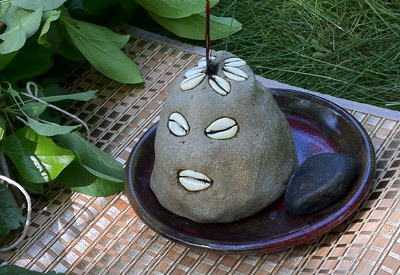 It is more traditional to work through a diviner (an Olorisha or a Babalawo) to ascertain whether an offering or sacrifice is needed and specifically what kind (as determined in the reading). Only an Olorisha or Babalawo can do this for you. Some of the safest offerings you can give Eleggua or Eshu are toasted corn, smoked fish, rum and cigars. These are his favorite items no matter what road you happen to be working with. Keep in mind, however, that Eleggua (as with all the orishas) becomes accustomed to the way you treat him. If you break your pattern or change the way you’ve been treating him he will become upset and block up your paths. Many people work with Eleggua every monday by pouring out a tiny libation of cool water and praying to him, but the first monday you miss that routine will be the day that Eleggua really trips you up. So keep that in mind before you start setting up a steady pattern of veneration. Again, work with a godparent for optimal results. What advice or feedback to you have for people who mistakenly try to draw parallels between or equate Legba with Eleggua, Eshu, or Exu? Houngan Matt: DONT! The Legba spirits all stem from the Fon people, who are not the same as the nations who carry those other spirits in their own distinct religions. Legba is NOT Eshu any more than the Virgin Mary is Quan Yin; the powers come from separate religions that maintain very separate and distinct cosmological and metaphysical functions. Even where there may be SOME passing similarity between the spirits (much like the Virgin Mary and Quan Yin are both known in their respective religions as Merciful) the differences in the religions are vast… attempting to blend the systems or cherry pick between them is a deep insult to the spirits who are accustomed to being carried within their traditions (which, over the centuries, THEY have created and guided in their evolutions). Just as Quan Yin would probably herself be horrified to be invoked in a service featuring a divine son’s blood and flesh being offered to a congregation in the form of Catholic Communion, the different spirits known as Legba, Exu, Eshu, and Ellegua would be deeply unhappy at the resulting dissonance of forcing them into boxes where they do not belong. Im often asked why they seem to serve similar function (which I gotta say after all of my reading they really DONT) but why us priests involved in the different traditions have little heart attacks when people cherrypick and mix… and my best example is modern math and Physics. We’ve all heard about Quantum Physics, a series of mathematical equations and theories that seek to explain how the world works at its smallest possible level. We’ve also all heard about Newtonian and Einsteinian systems of Physics, which are mathematical equations and theories that seek to explain how the universe functions on a grand scale of light, distance, speed, and gravity. Both systems work…. until they’re mixed. The equations are incompatible, the math cannot be justified, and instead of any answers that make sense the equations produce nothing but meaningless garbage. With our religions, I recommend keeping the same separateness and approaching each as *what it is* instead of trying to shove them into places where they do not belong. Just as in physics, attempting to place Exu in a Vodou paradigm or lifting a Legba spirit out of his home (or worse, calling Ellegua Legba and insisting Legba works through a concrete head that may or may not have been made by it’s own system’s priests) is bound to fail and practically guaranteed to make very unhappy spirits. When it comes to the spirits that govern not only our communication skills but out ability to maintain relationships with ALL the other spirits of their respective systems, upsetting these guys or trying to make them work as something they’re not is just a UNIVERSALLY bad idea. A person CAN work multiple systems when properly guided by initiates, but just like our example of Quantum versus Einsteinian physics, those systems need to be kept separate and worked on their own time, NEVER blended. ConjureMan Ali: Simply put; don’t. Exu is not an orisha, he is not a lwa, he is not a mpungo, he is a being all himself. Furthermore, Exu is from Brazil and he has nothing to do with the African Traditional Religions more commonly known here in North America. Exu is a very territorial spirit who is HUGE on respect, trying to force-fit him into your own preconceived notions, or misconceptions will only anger him and cause trouble. If you truly are interested in Exu and feel called, then don’t approach with the arrogance that you are entitled to his power. Instead learn about him properly from an initiated Tata or Yaya and house/terreiro and follow the proper paths of working with him. To give an analogy, if you were traveling to a foreign country that spoke a different language and you approached a very important official and demanded that they serve you and they better speak English, how do you think they’d respond? You’d be lucky if you got away with a crossed look. Just as you’d try to learn a bit of the local language, learn the proper customs and protocol, so too must you with Exu. Don’t think you can buy some “Exu poppet” or “Pomba Gira Oil” and you’ll be able to work with them. Rev. Dr. E.: Just don’t! To people who try to draw parallels between Legba, Eleggua/Eshu and Exu I say “Please remove your European lenses!” Just because things may have similar traits does not mean they are the same being. Chango throws lightning and so, too, does Zeus but they are not the same spirit/god/entity. When you try to draw parallels and create false equivalencies between spirits of different cultures and religions what you’re really doing is simplifying for your convenience (and laziness). Take the time to understand the differences between the cultures. Follow the proper channels and protocols of each culture and religion to honor the spirits therein, and to respect the sacrifice the ancestors made to preserve these traditions in the face of slavery. If you’re going to work with the orishas, then do so through the religion THEY passed down to us, not in an invention you created out of European traditions and techniques. Keep things separate because they ARE different and they ARE separate from one another. If we painted everything in the same light the whole world would be a boring shade of grey.